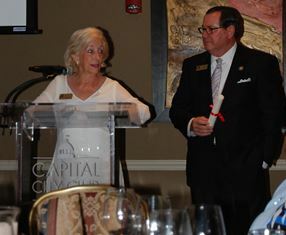 During its June quarterly meeting, Thursday night, June 9, was reserved to celebrate the Alabama State Council on the Arts’ (ASCA) 50th anniversary at a reunion dinner for past and current Council members and staff. A revolving photo-expose reflected faces and events dating back to the creation of the Council in 1966. A Council history was compiled and presented to the alumni gathered, along with a Senate Resolution sponsored by Senator Tom Whatley (R-District 27) from Opelika. The Resolution in part recognized the Council’s 50 years of support for all of the arts and artists in Alabama and highlighted the significant emphasis on arts education, maintaining a nationally recognized folk arts program, providing matching grants to hundreds of organizations statewide for programming in the literary, visual, and performing arts. These programs included concerts, exhibitions, festivals, community plays, and diverse in-school presentations. The Resolution also noted the Council’s support of Alabama artists through fellowships, award programs, employment through grant-funded projects, residencies in the classroom, apprenticeships, and a wide range of promotional activities. The evening celebration and program was capped off with a series of reflections by Al Head, the Council’s Executive Director for the past thirty-one years, eight past Council chairs, and other past and current Council members. The 70 individuals in attendance all played a significant role in the successful history of the Council and the growth of all of the arts in Alabama over the past fifty-years. The Alabama State Council on the Arts was created by Executive Order No. 29, on April 8, 1966 by Governor George C. Wallace. The order states, "The practice and enjoyment of the arts are of increasing importance to the personal welfare of the people as a vital aspect of our cultural heritage and as valued means of expanding the scope of our educational programs." Legislative Act No. 551 established the Alabama State Council on the Arts and was signed into law by Governor Lurleen B. Wallace on September 8, 1967, thereby creating an official State Arts Agency as required by the National Foundation on the Arts and Humanities by Act No. 1065. For more information, contact Barbara Reed at 334-242-4076, ext. 223 or visit ASCA’s website at www.arts.alabama.gov.